Boys and Girls, ages 11 through 20, can participate in the flagship of GBPA’s scouting program—the Fife and Drum Corps. Formed in 2004 as Boy Scout Troop 53 and Venture Crew 53, the Fife & Drum Corps (FDC) of Maytown PA, rechartered in 2010 as Venture Crew 1861 of Gettysburg in the New Birth of Freedom Council with the GBPA as their Chartering Organization. The FDC began reenacting at the 145th Anniversary of First Bull Run in 2006 and continues to participate in numerous living history events, battle reenactments, veterans' ceremonies, scouting events, community festivals and parades. They portray the Field Music, 1st Pennsylvania Reserve Volunteer Corps and occasionally portray the Confederate musicians of Johnson’s Division ANV. They were featured in the August 2007 issue of Boys’ Life magazine participating in Gettysburg’s Remembrance Day ceremonies. The FDC performed for the 2009 rededication of the Lincoln Memorial in Wash. D.C. and Pennsylvania’s kick-off for the 150th Anniversary of the Civil War in the State Capitol in 2011. In addition to playing fife, drum or bugle on the battlefield or in parade, some members also perform camp music on strings, tin flutes and drums. The group also fields a Civil War color guard. Venture Crew 1861/1st PRVC is a unit member of the 1st Regiment, United States Volunteers (USV) and the Pennsylvania Reserve Battalion - Civil War reenactment organizations that provide for event organization and safety. The 1st Pennsylvania Volunteer Reserve Corps (Venture Crew 1861) performs The Battle Cry of Freedom at the Lancaster Barnstormer’s Stadium in August, 2014 as part of Support Homeless Veterans Services Day at the stadium. The 1st Pennsylvania Volunteer Reserve Corps (Venture Crew 1861) performs a Memorial Day tribute to PRVC Veteran, Thomas Judge on May 30, 2015 at St. Mary’s Cemetery in Lancaster, PA. Thomas served as a drummer, Company B, for the duration of the war: 1861-1865. The Fife and Drum Corps (FDC) has an extensive musical performance and Civil War reenactment schedule that takes members from playing for visitors at the Gettysburg National Military Park, to battle reenactments in Virginia. While it is a busy schedule, not all FDC members attend all events. A schedule of events is continuously updated on the group website. Current members hail from all over Pennsylvania and Maryland. Venturers (aged 13-20) may also take advantage of BSA High Adventure regional and national opportunities. Musical instruments, Civil War uniforms and equipment are provided by the FDC although some members own their own. The Corps also provides group instruction in fife, drum or bugle, and participates in special instructional events. As a practical matter, drummers have some outside background in rudimentary (snare) drumming; fifers have a music background in another instrument and are trained to the fife by the corps; buglers begin as accomplished trumpet players. Musicians are always welcome. Infantry rifleman or flagbearer positions may be available in the Venture Crew’s Color Guard/ Company C, 1st PRVC. Join us in this unique scouting adventure! Join our Civil War reenactors through any of these groups. Ages 11-20 accepted. Any Boy Scout with interest may participate while maintaining their Troop affiliation. Others, please contact us! Geography is not a barrier to membership! 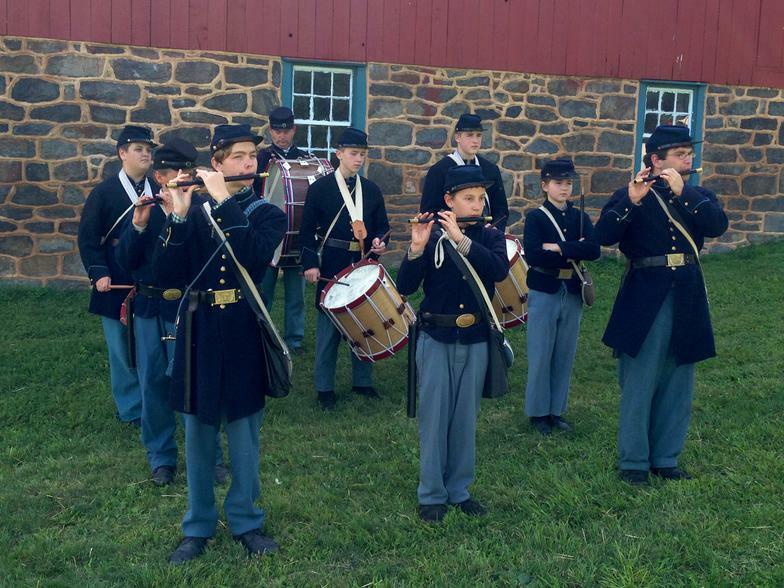 Youth aged 11-20, or adults, interested in Civil War music and reenactment, contact us! 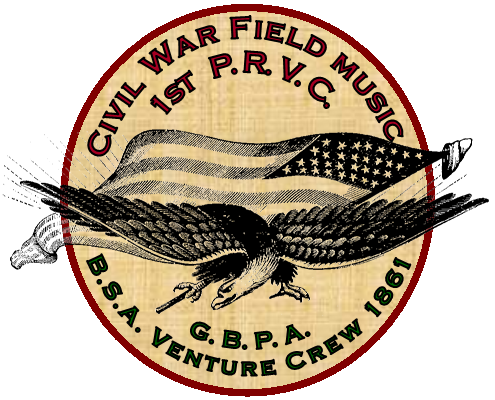 Questions about the GBPA Scouting or Fife & Drum program may be directed to Michael Cassidy, GBPA Board Member and Advisor of Venture Crew 1861. He can be reached on his cell# 717-368-1235 or fifeanddrum@comcast.net. Additional information including the FDC’s schedule and activities can be found at fieldmusic.org.